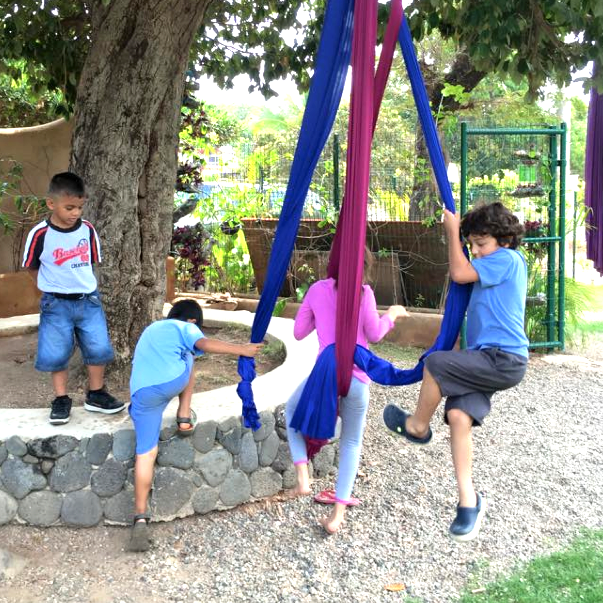 Everyday at el Jardín our purpose is to find the right balance between Being, Doing and Learning. Evey morning we start the day with joy… singing, sharing & awakening our presence in a circle. Using Montessori materials, children develop their academic & sensorial skills in a fun and self-correcting way. * Activities are divided in 5 areas: Practical Life, Sensorial, Language, Math, Cultural. Learning a new language is always exciting, especially through fun books, games and songs. The daily simple tasks can become learning experiences. We cut, spread, mix, measure, bake... and eat healthy meals! Our organic garden is like a lab, here children learn directly from the natural cycle & the importance of taking care of our environment. Learning a new language is always exciting, more if is through fun books, games and songs. Listen carefully to the sound of the bell... Be aware of your body, your breath, your emotions, your thoughts... find a place of peace inside of you. Singing, dancing and freely expressing ourselves with our bodies helps us develop balance, confidence, motor skills and creativity. Painting, watercolor, clay, wood crafting, textures, recycling... At el Jardín all children express themselves with freedom.